A radiologist is a physician who specializes in imaging techniques. A radiologist assistant works closely with radiologists to administer the tests that patient’s physician requires. The medium annual income for radiologist assistant at all levels of experience and certification across the U.S. was $54,340. The top 10 % of these assistants earned in excess of $76,850 annually, while the bottom 10% earned less than $36,510. The middle percent earned between $44,200 and $65,590 annually. Basically assistants with advanced training earn more than those with lesser training. 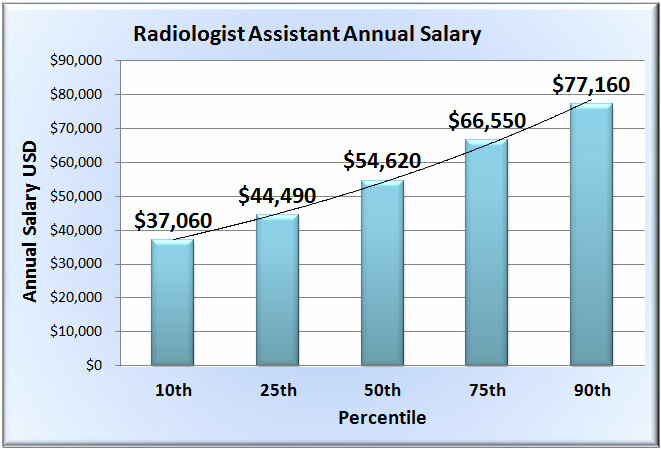 A radiologist’s assistant salary can be affected by geographic region; California based assistants earn about $65,920 annually, those in Massachusetts earn a bit higher to about $71,510, while those in West Virginia earn the lowest, about $41,720. General hospitals and surgical hospitals provide the largest employment source for this job; as of May 2010, 129,750 jobs were provided. 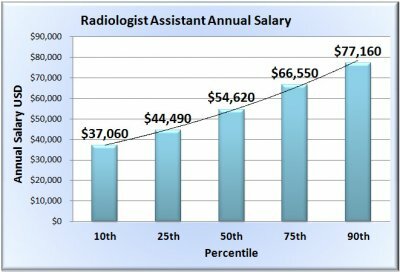 Radiologist assistant salary also vary with the type of hospital; those who work in hospital environments earn an average annual wage of $54,810 and those in private physician offices earn about $50,840. There are fewer jobs for radiologists’ assistant in scientific research and development services sector. However, those who work in this field earn the highest annual wages of about $65,680.